The 18th Annual Gnaoua Music Festival took place in Essaouira, on Morocco’s Atlantic Coast from May 14th -17th. Every year, the festival showcases the best of Moroccan Gnaoua musicians and a wide array of Gnaoua and world music. Gnaoua is a musical genre based in Sufi Islamic culture with its roots in sub-Saharan Africa. 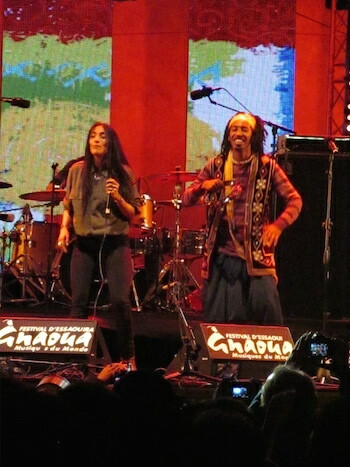 Moroccan and international artists are also invited to perform, often, in unique fusion concerts alongside Gnaoua groups. One of the most anticipated World Music acts at this year’s festival was Hindi Zahra, a Moroccan-born vocalist who played Essaouira for the first time. Born in Morocco in 1979, Hindi Zahra (her stage name is an inversion of her real name) released her first album, Handmade, in 2010 to critical acclaim, winning various awards in France, where she has been based since 1993. Hindi Zahra sings principally in the unusual combination of the Berber language of Morocco and in English. In contrast to her Moroccan linguistic heritage, her musical heritage is an international mélange of folk, rock, jazz, soul and blues, as well as African, Spanish and Latin influences. The timbre of her voice and the fluidity of her movement reveal her North African roots. 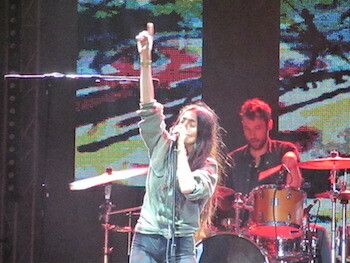 In Essaouira, the audience was treated to an early release of tracks from Hindi’s new album, Homeland, released in April 2015, as well as some popular favourites from her back catalogue. She strutted on stage, channelling a rock goddess persona, to open with To The Forces, a song, which celebrates the mountain Berbers of Morocco, strong and proud, living at one with nature, despite conditions of extreme poverty. The song is the opening track from Homeland, an album that was largely written in Marrakech, at the end of the promotional tour for Handmade. At this time, Hindi says, she was exhausted after 400 gigs in 2.5 years. She shut herself in a traditional riad (townhouse) with only an internet connection and her own creativity. The result is Homeland, an album conceived in and inspired by Morocco. After a night of powerful funk, fusion, jazz and Gnaoua music from the likes of Gnaoua rock star, Maalem Omar Hayat and Nigerian Afro Beat drummer, Tony Allen, Hindi Zahra had a challenge ahead of her to maintain the energy of the night’s concerts and capture the attention of the Essaouira audience. She not only held her own, she rocked the main stage. Her lilting voice recalls Joni Mitchell or Norah Jones, but these comparisons belie her rock star presence, which is far larger than her petite frame would suggest. The locals were enthused by her Berber lyrics and she was clearly excited to be finally playing at Essaouira with such a wealth of new material. The appeal of Hindi Zahra is in the way she embodies both fragility and strength and in the sheer diversity of her songs, which she writes herself. Her voice and her energy transform themselves effortlessly from the Latin rhythms of her big hit from her first album, Beautiful Tango, through the jazzy tones of Imik Si Mik from the same album and sung mainly in Berber, to Stand Up (from Homeland), which in Essaouira she performed to a ska/reggae arrangement with Mehdi Nassouli of Agadir. In Any Story, from the new album, Hindi Zahra’s voice haunts with a mystery that suggests an artist more experienced and accomplished than her years. Hindi Zahra’s albums are available to download on I-tunes and on her website directly. A Video for Hindi Zahra’s new album, “Any Story” shot in Theatre Royal Marrakech and Legzira Beach, Morocco.